This postcard has stamped on the back ‘J. J. CUNNINGHAM PHOTOGRAPHER’ and the number ‘704’ is written on in pencil. The engine is ‘Whitworth’ or ‘Waterloo’ or ‘6ft Jumbo’ or ‘Small Jumbo’ LMS No. 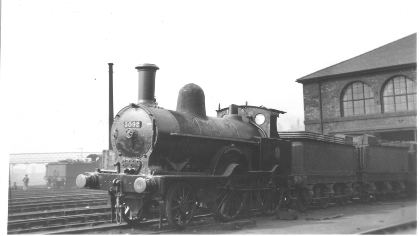 5092 Violet, which was originally LNWR No. 763. I think this is Carlisle Upperby with the engine stabled in front of the works rather than the shed. The loose tenders tend to support this idea. The footbridge in the left background seems to be in the right position after reference to the Ordnance Survey map. J J Cunningham was a frequent recorder of the Scottish scene and Carlisle would just enter his area of operation. I believe he lived in Edinburgh. On taking a closer look she lacks a hose on the front vacuum pipe and is not coupled to a tender. She also retains original style lamp sockets. There is an LMS crest on the cab side, so livery must be LMS crimson lake, although it seems to be in poor condition, or maybe just dirty. The nearest two tenders appear to be still in LNWR black livery. Yes, it‘s certainly at Carlisle as Tom says, just outside the works. From at least 1926 until 1932 the photographer J. J. Cunningham lived at Annan, Dumfriesshire (around 18 miles from Carlisle) before returning permanently to Edinburgh. According to Essery & Jenkinson’s ‘LMS Liveries’ it seems 5092 wasn’t painted in LMS red, but was in plain unlined black.